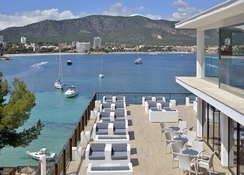 Alua Hawaii Mallorca & Suites (formerly Intertur) is a luxury seafront hotel in Palmanova in the island of Mallorca. The pleasant Mediterranean climate of the island, the proximity to the beach and the superb services provided by the hotel ensure a comfortable and relaxing stay for travellers, both couples as well as singles. There are plenty of accommodation options, such as all-inclusive, bed & breakfast and half boarding, suitable for a wide variety of budgets and needs. The hotel offers massive pools with sun loungers and parasols, gourmet restaurants, outdoor terraces with stunning sea views, luxuriant rooms, mini clubs, chill-out zones for kids and daily sports activities and shows for all age groups. It also comes with 24-hours reception service, airport transfer and a fitness centre. All these world-class facilities, coupled with a stunning contemporary décor, make this hotel the best place to spend the summer at. 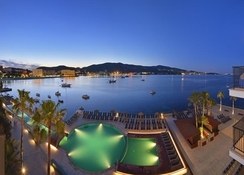 The nearest airport is Palma de Mallorca Airport, which is located at a distance of around 16 km from the hotel It takes about 30 minutes to reach the hotel. Palmanova, the beautiful Spanish resort of the island, is situated at a distance of 3.4 km. The beach is located right across the hotel. Alua Hawaii Mallorca & Suites has a large variety of rooms to cater to different kinds of tastes and budgets. All the rooms of the hotel have a soothing décor with bright upholstery and sleek, contemporary furniture. They come with mini fridge, tea and coffee making facilities, satellite TV, air conditioning, safe, telephone, Wi-Fi and private balcony. The various accommodation categories include single rooms, twin rooms, twin rooms with sea view, family rooms, premium rooms with sea view, junior suites, junior suites with sea view, suites with sea view and one-bedroom apartments. The hotel has one restaurant, which serves buffet meals featuring a wide variety of dishes and show cooking. Mediterranean cuisine is prominently featured in the buffet. There is also a terrace bar, which has breath-taking views of the Mediterranean and a snack bar, located right by the poolside, where guests can enjoy a delectable selection of snacks and drinks. 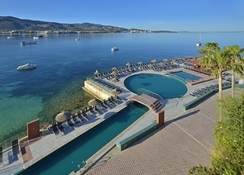 The hotel comes with outdoor pools for adults and children, a large gym featuring the best equipment and free weights, terraces with chill-out zones for guests to sit back, relax and enjoy the panoramic views of the island. The hotel also has a list of activities especially designed by its staff to keep guests engaged during their stay. For all children between 4 and 12, there is a Miniclub. For adults there is a free Wi-Fi zone, which helps guests to stay tuned to what’s happening in the world of social media. The 24-hour reception services help guests to check in and check out with ease, while the hotel’s conference room provides the perfect place to host social gatherings and business meetings. staff extremely helpful and polite .Would definitely return to this hotel . The hotel was extremely clean and comfortable. The suite wasn't quite what we were expecting the room itself was spacious and comfortable, however it was quite noisy being situated around the pool and the living room looked out onto the street and therefore the balcony wasn't a good place to sit! The hotel is beautiful and it’s a great location. The rooms are really nice and the staff are extremely helpful. The only downside to the hotel. Was that the rooms didn’t come with irons, so you had to pay a deposit and go to the other side of the hotel to iron your clothes. So I would recommend that you bring one. The pool was freeeeezing like I’m not even leaving my feet in there for too long type of cold. Which was a shame and it was a hot day as well. Lastly the breakfast buffet had soo much pork. My boyfriend doesn’t eat pork, so he didn’t have a large variety to eat from. Other than that, I will definitely be going there again. We took my son and his girlfriend here for his 18th birthday, we loved the position, the views & the terraces and pool area of the hotel. We selected the hotel as it has a adult only roof top bar, but this was not open and the entertainment was not very good, more child orientated than adult. We were all inclusive which was good you could literally eat and drink all day long, if you so wished. The staff were very friendly and the rooms at the front of the sea side hotel were very good, although our son and many others had problem with the showers flooding their bathrooms, although we did not. Hector in the bar was very helpful. The pools were colder than the sea!